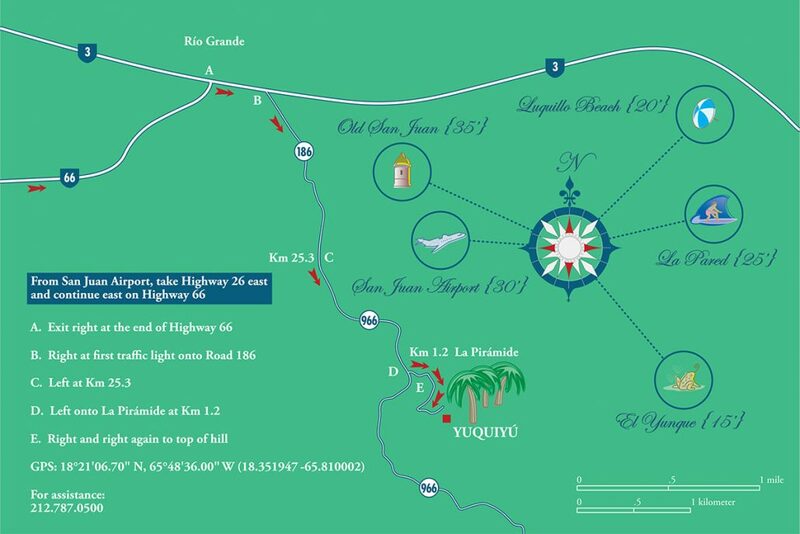 Directions: Yuquiyú is in a rural location without a street address. If you use Google Maps, be sure to select “Yuquiyú Treehouses” or use the following link: Yuquiyú Treehouses. You can also find us by using the maps and directions below. 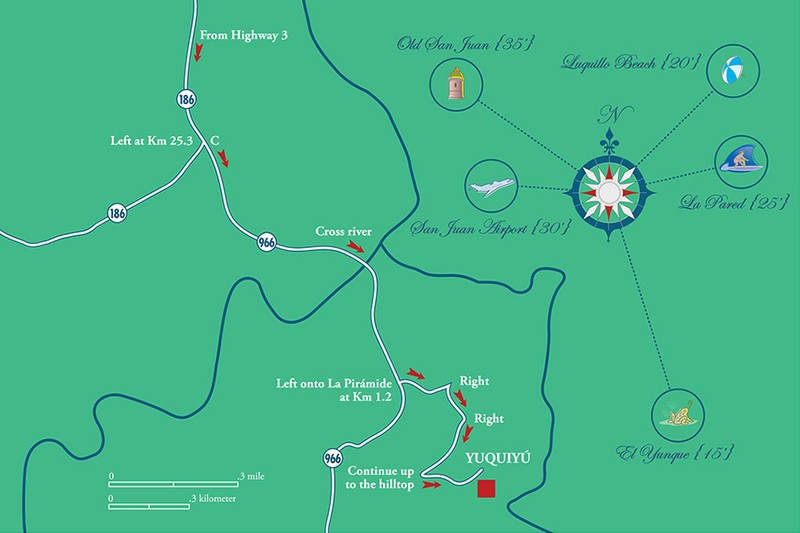 Travel time from the San Juan International Airport is 30 minutes. If you prefer the Scenic Route Along the Ocean, travel time is 55 minutes. Rental car required: Guests should be aware that a rental car is essential due to a lack of public transportation, taxis and car service outside of San Juan. Check-in: Check-in starts at 3 pm. In order to appreciate the starry night, there is no trail lighting. Therefore, it is best to make your initial arrival during dayight hours. We will meet you and show you to your treehouse. Since we have no porters, you will need to carry your own baggage. To take advantage of any time you have before checking in, you may wish to consider our recommended restaurants and explorations. Check-out: Check-out is at 12 pm. Just leave the keys inside the treehouse and close the doors. After checking out, you are welcome to store your baggage in our office, and continue to enjoy the property until it’s time to depart for your next destination. Telecommunications: All major cell phone carriers have coverage in our area. We do not have WiFi Internet. Keeping in touch: If you have any questions or concerns, the best way to reach us is by a phone call to (212) 787-0500, a text message to the same number or a WhatsApp message to +12127870500. Housekeeping: Additional housekeeping services are provided for stays of over three nights. We will let you know the dates and times in advance. Breakfast: In each treehouse, we provide everything our guests need to French press coffee from a Puerto Rican hacienda, brew an herbal tea from our farm and make a vegan breakfast of granola, coconut milk, cashews, dried figs, dairy-free yogurt, freshly-picked fruit and lemonade. Honey, non-dairy creamer, olive oil, Himalayan pink salt and black pepper are included. Kindly let us know if you would like more of any item. Vegan: Guests can use the well-equipped kitchenette in their treehouse to prepare their own food, including eggs and dairy. Please note that Yuquiyú is meat free (from any kind of animal, including mammals, fish, fowl and others). We ask guests to respect that principle by not bringing any meat onto the property. Restaurants offering a variety of cuisines are close by. Smoke Free: We are smoke free everywhere on the property except in the parking area. Screens & repellents: The sleeping area of each treehouse is fully screened (older photos do not show the screens). There are no bothersome insects from dawn to dusk. From dusk to dawn, you can close the doors and windows — the wooden louvers let air in and the screens keep insects out. But, to better appreciate the gentle breezes and sounds of the rainforest at night, leave the doors and windows open. Even though we have few mosquitoes, you can reduce the risk of a bite by showering before going to bed and by applying the Repel Plant-Based Lemon Eucalyptus repellent or the Cutter Backwoods DEET-based repellent that we provide. Cutter Backwoods is more effective and longer lasting. Wind also is effective against mosquitoes. Set your floor fan to medium speed. Explorations: With one of our treehouses as your base, you can discover the rainforest, multi-hued beaches, sea turtle nesting sites, coral reefs, a bioluminescent lagoon, ancient petroglyphs, a Spanish colonial city and Culebra Island. For an introduction, see our Explorations page. For details, see What Can I Do?. Once you exit right at the end of Highway 66 (A), turn right at the first traffic light onto Road 186 (B). Continue uphill to the Km 25.3 marker (C), then take a left. At that point, refer to the detail map, below. 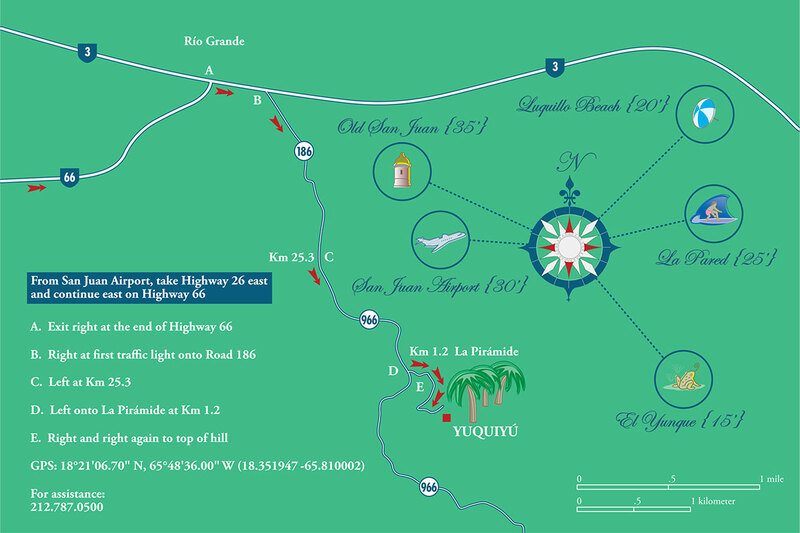 Once you’ve turned left at the Km 25.3 marker (C), you will be going downhill and cross a low, concrete bridge over the Espíritu Santo river. From the bridge, continue uphill toward the Km 1.2 marker. Just before that marker, turn left onto La Pirámide, go right and then go right again. Before long, you will come to a sharp turn and begin to climb the hill upon which Yuquiyú is located. Once you reach the top, you will see the Yuquiyú sign. Park in the flat, grassy area immediately beyond the sign. Our reception area (“Recepción”) is located down the gravel path located next to the sign. To save a trip back uphill, you may want to bring your baggage down with you.